This is an earthy and elegant soup adapted from Martha Stewart Living. 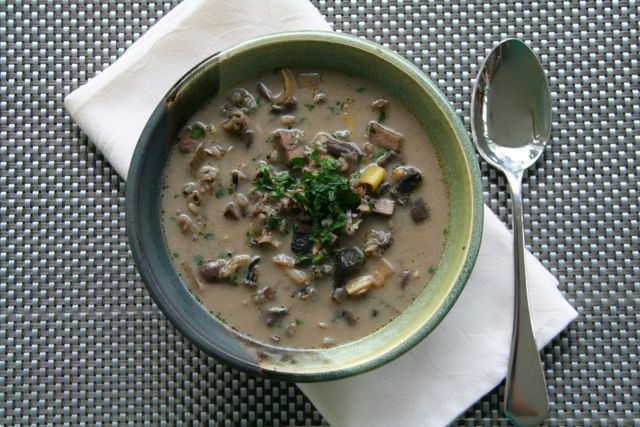 It uses a combination of assorted fresh mushrooms as well as dried mushrooms to give it a rich and complex flavor. I used fresh cremini, portobello, and shiitake mushrooms, but button or chanterelles could also be used. The bunch of beautiful leeks from my CSA share were also part of this lovely dish. I sautéed the leeks in red wine rather than sherry. We ate it with crusty sourdough bread and green salad. In a small saucepan, bring 2 cups of water to a boil. Add salt and wild rice. Cover; reduce heat to medium-low. Cook until tender, 45 to 60 minutes. Drain; set aside. Meanwhile, make the dried mushroom powder. In a spice mill or coffee grinder, pulse the dried mushrooms to a fine powder. Store in an airtight container at room temperature. In a large saucepan or dutch oven, heat half the oil over medium-high heat. Add half the mushrooms; season with salt and pepper. Cook until browned and tender, about 7 minutes; transfer to a bowl. Repeat with the remaining oil and mushrooms. Reduce heat to medium-low. Melt butter; add leeks. Cook, stirring, until softened, about 5 minutes. Stir in 2 T of mushroom powder; cook 1 minute. Add sherry and soy sauce; cook 1 minute more. Add stock to pot; bring to a boil over medium-high heat. Add mushrooms; return to a boil. Reduce heat to medium; cook 20 minutes. Stir in wild rice, cream (or half & half), and parsley; adjust seasoning, and serve. Garnish with parsley, if desired. Definitely going to make this recipe and invite NCR. You take such good care of NCR! 🙂 I hope you enjoy the soup. Oh dear – I don’t mean to look like a stalker, liking all of your posts – they just genuinely all look amazing! AND I have half a cup of wild rice sitting around that I didn’t know what to do with – ka-ching! Thank you so much! 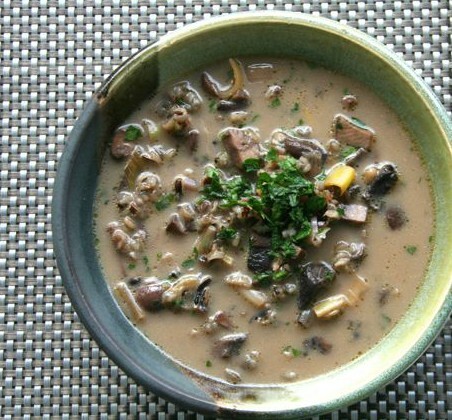 Wild rice is wonderful in this soup- I hope you like it!